With God’s will, we are leaving today for Armenia, Artsakh, and Holy Etchmiadzin. During this visit we will personally meet with the families of fallen soldiers and officers who laid their lives while defending and protecting our Homeland and borders during the four day long war in Artsakh in April 2016. On behalf of you all, and with deepest gratitude, we will offer our condolences, prayers and love to their families and will present the funds, which at our request, you generously donated to the “HTAC Humanitarian Fund – Artsakh” in lieu of gifts, on the occasion of my 50th birthday. We humbly extend our gratitude to His Holiness Karekin II, Supreme Patriarch and Catholicos of All Armenians, for his auspices and fatherly blessing of this benevolent mission. 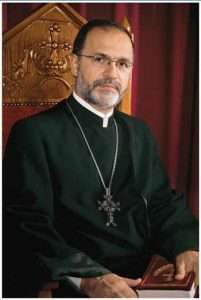 This project was made possible with the blessing of His Grace Bishop Abgar Hovakimian, Primate of the Armenian Church of Canadian Diocese and with the direct involvement of His Grace Bishop Vertanes Abrahamyan, Head Chaplain of the Republic of Armenia Armed Forces in organizing the mission. The project is also collaborated with the Primates of Dioceses of Armenia and Artsakh. We express our sincere appreciation especially to you for your heartfelt participation and your generous donations. We seek the blessing of our Lord Almighty and ask you to keep us in your prayers for the success of this mission. May God bless our soldiers as they defend and protect our Homeland and the many blessings and freedoms that we enjoy in our lives.